Marlin Sub-Aqua Club, consisting of Steve, Garry, Martin and Rob, were back in Plymouth on the 2nd of July 2018 for the Best of South West tour with indeep diving. The setup and accommodation was the same as last year’s, so feel free to read last year’s report for this and I will carry on with the interesting stuff, like the diving! Only Steve and Garry were in Plymouth and diving on the Monday. Martin arrived later that evening and I began my journey at 03:30 the following morning. 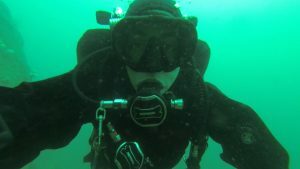 Today myself and Martin joined Steve and Garry to dive the HMS Elk. Elk was launched in 1902 and was eventually hired by the Admiralty in 1939 to serve as a danlayer (laying buoys in channels cleared by minesweepers) until she was sunk by a mine off Plymouth in 1940. After five or six attempts to get a shot in, and a minutes search at the bottom at 32 metres, we came across the boiler in the centre of the ship, half of which is above deck and the other below. Heading towards the stern I believe, (details are a bit hazy on this on due to sea sickness and probable mild narcosis) the ribs and beams survived with some of the plates heaped inside the vessel. 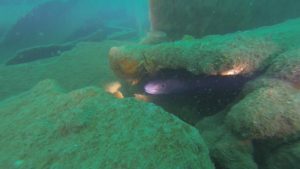 On reaching the stern we returned past the boilers and had a look at a large conger that lived here before heading toward the bow section which is more sunken into the seabed. Lots of pouting noted throughout the wreck but not much else, none the less we had clocked up 9 minutes of deco. 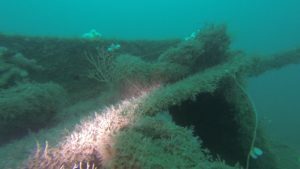 Our second dive of the day was the Glen Strathallen, a converted yacht which was sank on the orders of its owner in 1970 to serve as an underwater classroom. We eventually found her boiler at around 16 metres along with Garry and Steve looking at a cuttlefish. Within the boiler was a cheeky tompot blenny that kept me amused for some time before we went on to explore the freshly exposed plates of the wreck that had been uncovered during the winter storms. We finished off exploring the nearby reef before ascending by DSMB. After diving off of Panther yesterday we were today back on our favourite boat Seeker which also had a working oven for hot pasties! The day started later with a dive that needs no introduction, HMS Scylla. We dropped down onto the bridge to be met with visibility of approximately 4 metres before heading along the external walkways to the rudder where we crossed to the portside. Here we found a spider crab entangled in some lose fishing net, which we were able to release with all its legs attached. We ascended from here to the helicopter pad before heading along a walkway at about 15 metres. 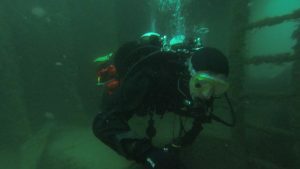 We then passed from side to side of the vessel through the larger rooms which had visibility of approximately 10 metres. We finished our dive by entering the bridge and then worked our way to the top of this. Lots of dead man’s fingers, and green anemones noted on the wreck as well as pollock. The second dive of the day was also a well know wreck, the James Egan Layne. Decent was via a fixed shot on the bow which we followed down to the sea bed where I noticed in the visibility of around 8 metres, a large section had come away to reveal the contents of the first compartment. With the possibly of some interesting salvage I decided to poke my head into the hole but on closer inspection noticed Garry’s fins already sticking out. Instead I was treated to a visit from a John Dory. We followed the vessel down the starboard side before entering through a hole into the second hold and followed the ship aft. Some large congers seen under the plates plus lots of blenny. At the end of the main ship we continued heading right to find the stern section. There were lots of grey sea slugs here plus a pile of boots soles, presumably part of the cargo. Continuing back to the main body we passed a stack of pipes and had a look around the engine. From here we passed through a corridor into an open top compartment from where we deployed our DSMBs at approximately 11 metres. Today, after a good lie in, we were back on Panther which at least now had a working microwave. Ropes off wasn’t until around midday due to the tides as today we had the opportunity to dive the Maine. Some distance from Plymouth, the Maine sits in around 32 metres of water about 2 miles off of Bolt Hpead after finally sinking there in 1917 following a torpedo attack from a U-boat. Back on Panther we had a long but pleasant journey out there helped by the bright sun, calm sea state and a large pod of around 50 dolphins. The boat laid shot took us right to one of the 2 large boilers which we briefly looked at before looking at a 3rd smaller which housed lots of lobsters. We were fortunate enough to be the first to enter the covered but open ended hold 3. Visability throughout the wreck was at least 10 meters so we had a good look around hold 3 by torch light which was home to some impressive congers and pollock. Heading toward the bow, looking under the plates we found lots of lobster before I noticed my deco time was clocking up rapidly. It was then I noticed my computer had defaulted back to 21% rather than the 32% I was using, however as the conditions were so good I decided to take the deco and carried on to find the hull bow which has nearly twisted off but still displays on of its anchors. It was now time to do 19 minutes of deco whilst avoiding Martin’s stare and distracting his annoyance by pointing out the odd compass jelly fish. Back on Panther we were given a longer surface interval to give us a bit more time on the next dive site and to soak up the rays whilst listening to Pink Floyd. After an hour and a half we were back down a shot to the boilers of the Persier. Built in 1918 Persier had had a rough time during the 2nd world war before finally succumbing to a U-boat attack in February 1945 and laying to rest in around 29 metres of water. Once we had had a good look around the boilers we adhered to the skipper’s advice and followed the prop shaft back to the huge rudder, still with its steering chains which is sat at an angle of around 45 degrees and had a nice swim-through at the base. Around this area we also found a large square metal structure with a spike on top which we thought may have also made up the ships unique steering system. Whilst heading back through the ship we found between the wreckage a large propeller, which we determined must have been a spare as the original had been salvaged years before and this one was not brass. 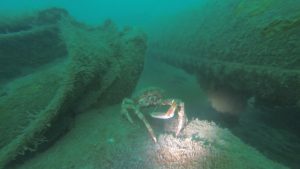 A few huge spider crabs we seen walking the wreck along with lots of pouting. We had one last tour of the boilers before ascent up the boat laid shot to settle in for 16 minutes of deco where we were shortly joined by Garry and Steve. We finished our dive around 17:30 so we were all ready for dinner and a pint. The first dive of the day was located east of the Eddystone lighthouse, and was not a known site, but one that the skipper had previously found on the fish finder and believed there to be 2 pinnacles with a gully running between them. Travelling down the shot we reached the side of the first pinnacle at around 18 metres and continued down the side passing lots of different coloured jewel anemones, hard and soft corals and pink sea fans before reaching a levelling off point made up of large boulders at around 33 metres. Again visibility was excellent at over 10 metres and allowed us to see the abundance of marine life on this site including lots of sea slugs and large fish of various species. Eventually we came to a cliff; not sure if this was the first or second pinnacle but we didn’t care as the life continued to be excellent. 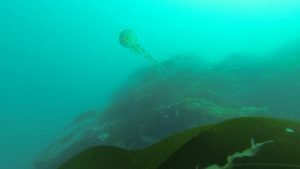 As we spiralled around the pinnacle we observed some large Cod, thick lipped Mullet and Pollock hiding in the kelp and hunting in the stronger currents coming from the seabed. All too soon it was time to get back on the boat, but at least the thought of tea and a pasty eased me away from this stunning dive. 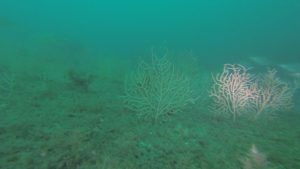 We moved location to dive another reef, Hand Deeps, the name given to the site because of the 5 pinnacles sticking up from the sea bed some 55 metres below. We weren’t planning on going quite that deep so it would be done as a wall dive. On arrival to the site it was apparent that the water had become more ‘milky’ but we were hopeful that it may have just been plankton in the first few metres of water. On reaching the bottom of the shot it became apparent that this was not the case with visibility around 2–3 metres. We headed across a plateau to find the wall before we dropped down to our maximum depth of 27 metres whilst following the wall on our left hand side. Much of the aquatic life was the same as the last dive but in fewer numbers and diversity. As we didn’t want to do a deco dive we had to adjust our depth accordingly. Unfortunately the kelp was down to around 20 metres so there was not too much to look at for the later part of the dive and we finished our dive at 52 minutes. We were now at the end of our week and if the skipper had offered me the weekends diving and accommodation I would have really struggled to turn it down. It had been a fantastic week due to the weather, visibility, and the great crew at indeep diving and my hope is that I can enjoy a few more days like this down in Plymouth before normal service is restored with the weather!